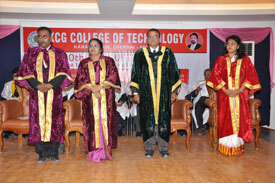 The 10th Graduation Day of KCG College of Technology was held on Saturday, 11th August, 2012 at 3.00 p.m. in KMC Auditorium of the Campus. 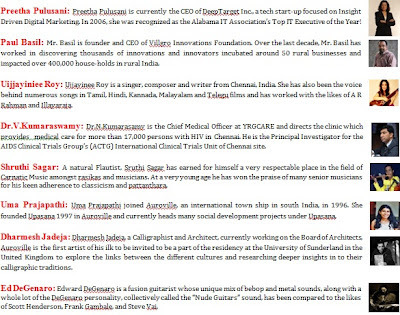 The function was presided over by Dr.Elizabeth Verghese, Chairperson of Hindustan Group of Institutions. Mr. Swaminathan Eisenhower, Chairman, CII, Chennai, Director – Operations, Saint Gobain Glass India was the Chief Guest. The Principal, Dr.T.Rengaraja, welcomed and presented the Annual Report sharing various achievements. During the Presidential Address, the Chairperson emphasized students to take up extra efforts by doing value added programs for meeting challenges. She also told that the college needs to maintain it status within first 10 ranks of University. The Chief Guest emphasized industries requirement for employment and suggested means to achieve the same. He has explained career opportunities for smart engineering students with examples. Two students got Anna University, First Ranks and other 4 rank holders were given Cash Award and Rank Certificates. 397 Graduates received their Degree Certificates comprising of UG & PG courses. Large number of parents witnessed the function. We take immense pleasure in sharing with you the conference that was organized at National Institute of Management Studies with the Theme "Significance of decision making in Globalisation Stressed". TED is an annual event where some of the world’s leading thinkers and doers are invited to share what they are most passionate about. “TED” stands for Technology, Entertainment, Design – three broad subject areas that are collectively shaping our future And in fact the event is broader still, showcasing ideas that matter in any discipline. The diverse audience – CEOs, scientists, innovationalists, philanthropists – is almost as extraordinary as the speakers, who have included Bill Clinton, Bill Gates, Jane Goodal, Frank Gehry, Paul Simon, Sir Richard Branson, Philippe Starck and Bono. In the spirit of ideas worth spreading, TED has created a program called TEDx. TEDx is a program of local, self-organized events that bring people together to share a TED-like experience. At our TEDxKCG event, TEDTalks video and live speakers will combine to spark deep discussion. We hope to bring together some of the most distinguished individuals from our local community to share, inspire and demonstrate the power of original ideas. 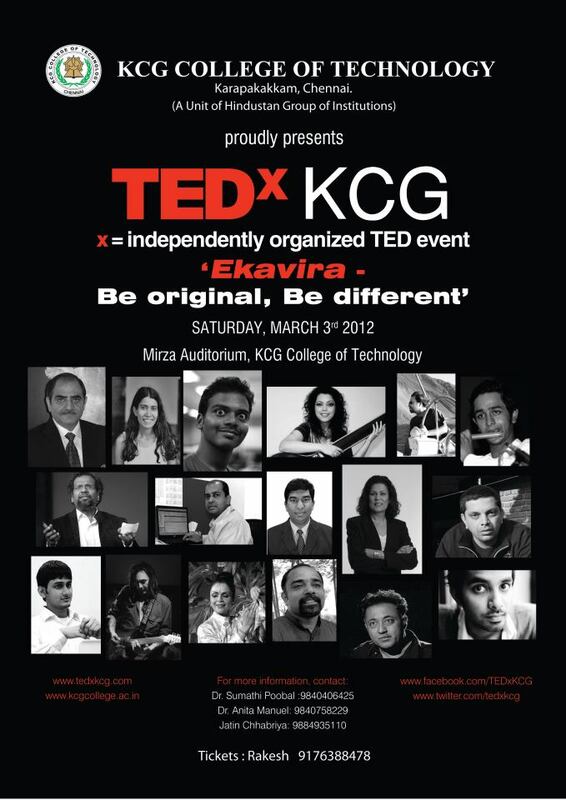 Our theme for this year is 'Ekavira: Be original. Be different.' where 'Ekavira' is Sanskrit for an Eminent person or hero. TED is an annual event that brings together the world's leading thinkers and doers to share ideas in technology, entertainment, design, science, humanities, business or development. The talks at the conference, "TED Talks," are also made available to watch for free on TED.com. In the spirit of "ideas worth spreading," TED has created TEDx, a program of local, self-organized events that bring people together to share a TED-like experience. At a TEDx event, TED Talks video and live speakers combine to spark deep discussion and connections. 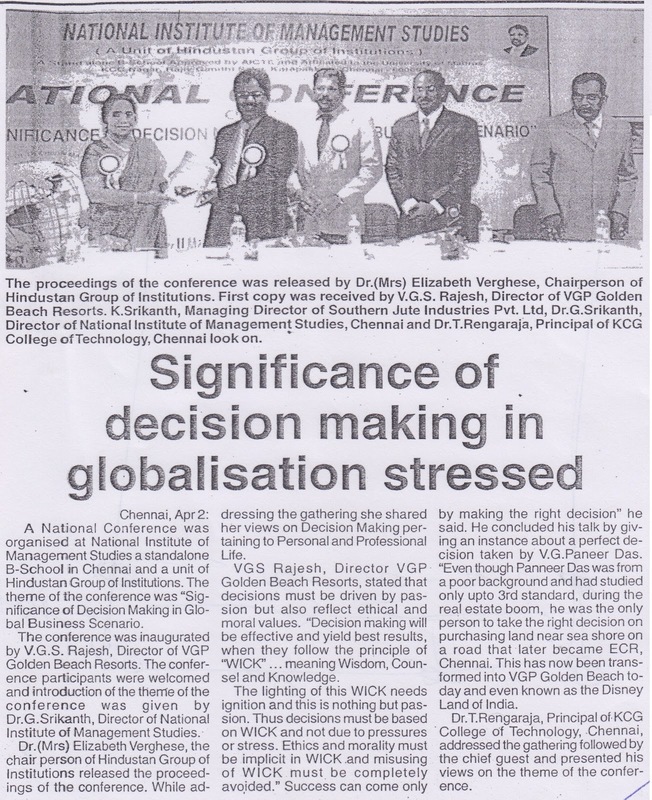 The host organization KCG College of Technology, a unit of Hindustan Group of institutions, was founded in 1998 by the late educationist and visionary Dr. KCG Verghese. We are excited to be a TEDx licensee and proud to present TEDxKCG; the event will take place on 3rd March 2012. We're determined to make this event an exciting and inspiring experience and have lined up an exciting, dynamic array of speakers. 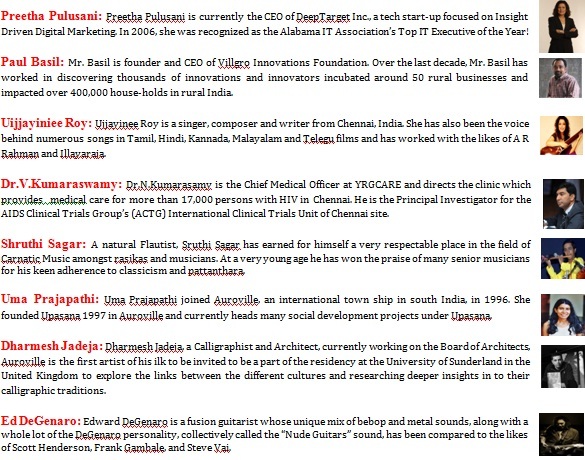 · Preetha Pulusani (Speaker, India) -CEO of DeepTarget Inc. Contact for information on 9176388478 or mail us at curator@tedxkcg.com . KCG College of Technology is organizing the first edition of Hindustan Young Leaders Conference (HYLC) from 16th to 18th March 2012 at the KC Tech campus. HYLC aims to bring together outstanding young students from around the world to build critical leadership skills in a global context. HYLC will simulate some of the most important international bodies giving college students a unique chance to discuss and debate real-time problems in an energy-charged environment. Based on the concept of a Model United Nations, HYLC is a dynamic, vibrant and inspiring platform for creative solutions to challenges that face today's world leaders. Beyond developing the youngsters into great debaters, it will also enhance their knowledge, impel them to research and reflect on global issues, hone their use of diplomatic skills to negotiate and persuade and above all empower them to become effective leaders wherever they go. 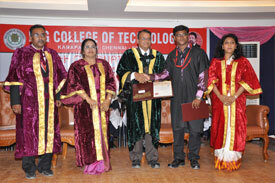 The host institution, KCG College of Technology, a unit of the Hindustan Group of Institutions, was founded in 1998. The beautifully landscaped campus, spread over 50 acres at Karapakkam, is about 10 km from Adyar on the Old Mahabalipuram Road, the IT corridor of Chennai. Through the years, KC Tech has conducted various international and national conferences for academics as well as intercollegiate technical symposiums for students. The college seeks to produce graduates who will think innovatively, communicate effectively, act ethically and participate meaningfully in a rapidly changing world. 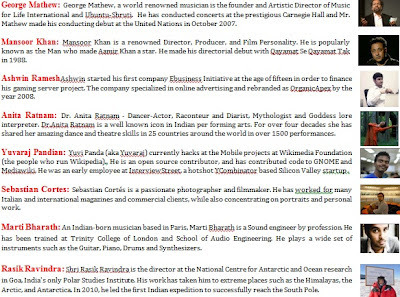 Six world bodies will be simulated in parallel sessions at the Hindustan Young Leaders Conference: Bilderberg Conference, UN Security Council, G-20, ICANN, Rio+20Summit, Indian Council. As may be observed, all the crucial areas of economy, foreign policy, cyber space, and environment will be analyzed during the three days of HYLC. Many of these councils are being simulated for the first time in India and we expect intense and lively debates during these sessions. Applications for the executive board which comprises of the Chair, Vice Chair, and Director for each council have come from United States, United Kingdom, Norway,Brussels, Dubai, Bangladesh, and from different parts of India. HYLC is dedicated to the youth of today who are the nation builders of tomorrow. 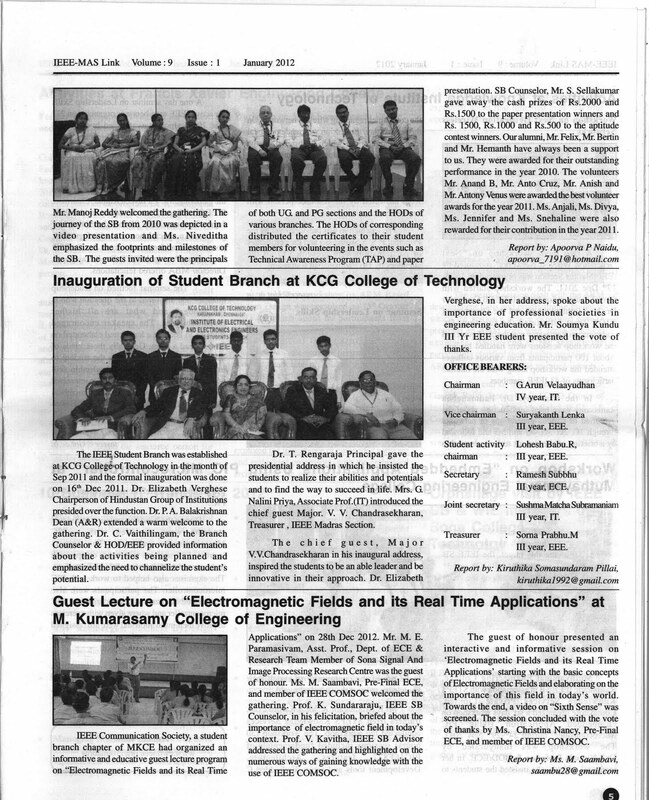 We take immense pleasure in sharing with you the IEEE students branch inauguration as published in IEEE News letter.